Here’s a more substantial offering from Africa – West Africa to be precise. The Zonophone label was the first to begin large-scale recording of records by and for Africans, with their classic EZ series which began in 1929, and featured primarily West African artists (they had tiptoed into these waters some years earlier with a “Zonophone Native Records” series). HMV started not soon after, beginning a massive spate of recording on the continent until the end of the 78 era. 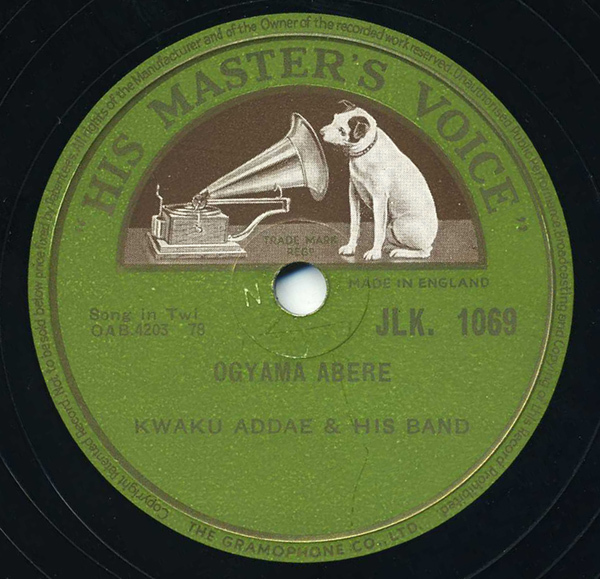 By the 1940s and 1950s, there were at least two dozen other labels producing 78s for the African populace. Thousands of historic, beautiful recordings were made in nearly every single existing country and region. The history of African music on 78rpm, as well as – of course – the music itself, is rich and fascinating. It’s some of my favorite music in my collection. Needless to say, African 78s are very difficult to find today. This track by Kwaku Addae is sung in the Twi language, and was recorded in Nsawam, Ghana, ca. 1954-1955. It features lovely vocal harmonies, and some classic West African guitar picking. And if you’re interested in more early guitar music from West Africa, this CD from Heritage is also top notch, and thankfully still in print. Thanks for extending your living room! i am looking for a specific track recorded in nigeria in the 1930s – would you email me?